ESCO (Equipment Supply Company) proudly announces their new OTR Tire Spreader [Model #90456] for off-the-road, mining, agricultural, and some larger truck tires. Designed to pick up where other tire spreaders fall short, the OTR Tire Spreader has 10 Tons of separating force along with a range of 6-34 inches. As a portable, lightweight handheld spreader, it is ideal for service out in the field and in service shops. Spreader operates by using air/hydraulic foot or manual pump (sold separately). Also available: the OTR Safety Lockout Bar, designed to be used in conjunction with the OTR Tire Spreader to assist in maintaining the separation between the tire, while releasing the hydraulic pressure from the spreader; making for a much “safer” environment for technician to work on tire. The New OTR Tire Spreader is available wherever ESCO products are sold. 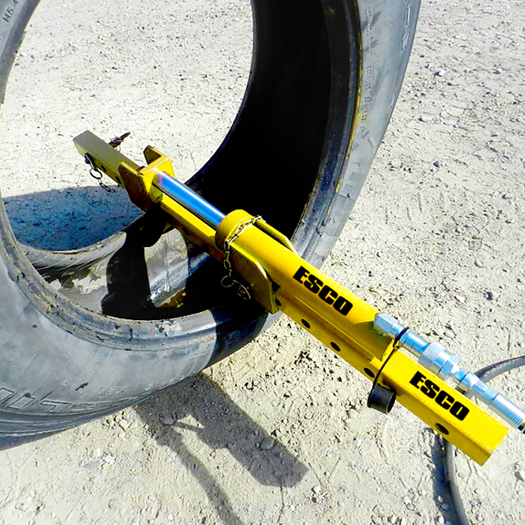 For more information about this product and where to buy ESCO product email sales@esco.net or call 352-754-1117 or visit www.esco.net and search “OTR Tire Spreader”.